Do you want to know that your potential new employee has the mental capability to progress and succeed and whether they are fast track potential? 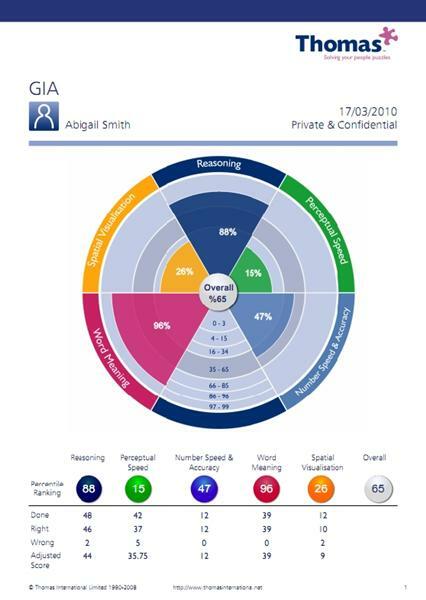 The report also gives an overall percentile combining the results of all five tests and is an accurate estimate of your candidate’s general intelligence, reflecting both fluid (increasing and acquiring new knowledge) and crystallised (‘hard wired’ from an early age) intelligence. Are they able to accurately think on their feet? Can they be given the autonomy to negotiate without authority? Can they be left to send that important proposal without a second check? Have the mental capacity to learn our wide range of products? Do they have the potential to grow in our business? Is this person a star of the future? What Does A GIA Report Look Like? An example GIA report can be downloaded here. Whilst the report contains some great indicators of performance and management suggestions our service also includes a full overview of the report on each candidate by a qualified Thomas International administrator. How Valid Are GIA Tests? • GIA measures fluid intelligence rather than IQ using a battery of five tests. Due to the upfront cost to Aaron Wallis payment is required in full (by BACS, credit card, IBAN or similar bank transfer) prior to setting up the GIA Testing.